With dangerous levels of climate change already in the pipeline, countries across the world are tasked with adapting to a drastically changing Earth. The Wilson Center and a consortium of international partners recently released an independent report commissioned by the G7 that examines the risks to stability from climate change. The report is unique because it looks beyond “fragile states” to examine fragility itself and the full spectrum of societal mechanisms that feed into it, Carius says. Though A New Climate for Peace offers numerous case studies, it primarily focuses on the drivers and risks that can propel any country into fragility. Though the report identifies seven compound climate-fragility risks, it emphasizes the cross-cutting nature of many of these vulnerabilities. Climate change is also interacting with environmental degradation, economic inequality, urbanization, population growth, and increasing resource demand. For example, Carius mentions widespread droughts and natural resource scarcity in Syria, which has destabilized livelihoods and caused widespread rural-urban migrations into cities already strained by sudden influxes of new residents. “Migration was not meant to be a centerpiece of our report because it cuts across many of the compound risks that we have identified,” says Carius. Beneath these climate-fragility risks lies the interplay of shock and resilience. Whether it’s volatile food prices, exogenous resource shocks, or extreme weather and natural disasters, resilient societies are better equipped to “bounce back” to normality after these shocks, whereas fragile countries may be crippled and permanently set back in terms of human development, security, or stability. However, interventions to bolster resilience must also be carefully scrutinized, says Carius. “Emergency responses, if they are well designed, can help to overcome existing political and ethnic conflicts, but ill-designed rehabilitation measures can deepen inequality and contribute to social unrest.” He mentions several examples of well-intentioned climate policies gone astray, sometimes exacerbating the problems they are attempting to alleviate. Carius calls for humanitarian aid to be “climate-proofed” by integrating across silos, like health care or poverty reduction. Likewise he suggests finding ways to better coordinate humanitarian relief with long-term development efforts, climate change adaptation, and peacebuilding. The report shows that there is still much progress to be made in this area. “Both domestically and internationally, we are far away from breaking down the sectoral barriers and silos that exist,” says Carius. A New Climate for Peace underscores the need to bring these sectors together by placing a cross-cutting goal – resilience – at the forefront of the global agenda. By strengthening institutions, countries and communities will be better prepared for the increased variability and risk that comes from living in a changing world. 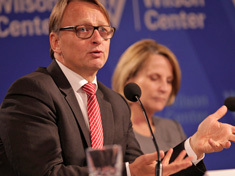 Alexander Carius spoke at the Wilson Center on June 22. Download his slides to follow along. Sources: A New Climate for Peace, UN Intergovernmental Panel on Climate Change.